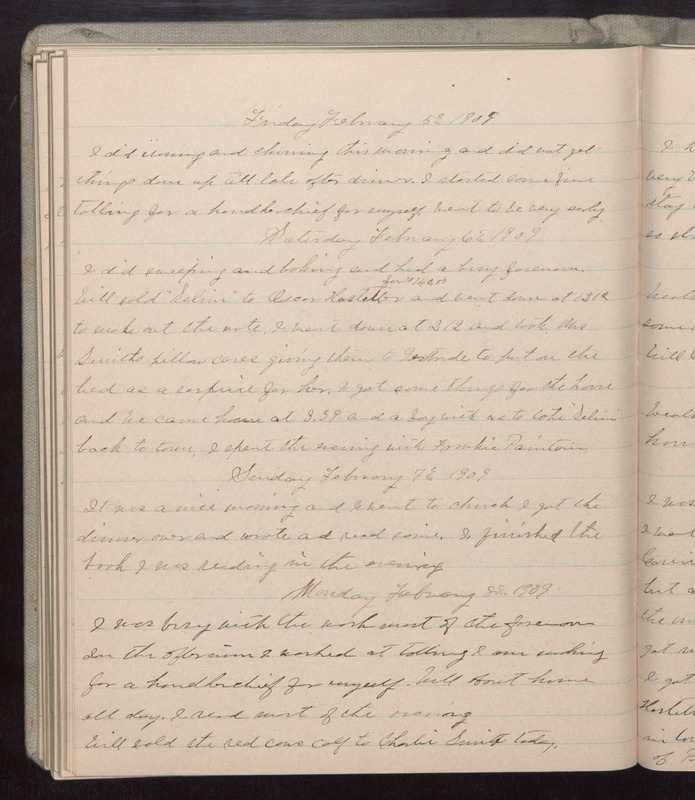 Friday February 5 1909 I did ironing and churning this morning and did not get things done up till late after dinner. I started some fine tatting for a handkerchief for myself. Went to be very early. Saturday February 6 1909 I did sweeping and baking and had a busy forenoon. Will sold [illegible] to Oscar [Hostatter?] for $140.00 and went down at 12.12 to make out the note. I went down at 2.12 and took Mrs Smiths pillow cases giving them to Gertrude to put on the bed as a surprise for her. I got some things for the home and we cam home at 8.39 and a boy with us to take [illegible] back to town. I spent the evening with Frankie [Pointoin?]. Sunday February 7 1909 It was a nice morning and I went to church I got the dinner over and wrote and read some. I finished the book I was reading in the evening. Monday February 8 1909 I was busy with the work most of the forenoon In the afternoon I worked at tatting I am making for a handkerchief for myself. Will about home all day. I read most of the evening Will sold the red cows calf to Charlie Smith today.